Bears quarterback Jay Cutler has been slinging money-balls on third down this season. If your team needs to convert a third down to keep a crucial drive alive, who do you want at quarterback? This isn’t a joke. The Bears quarterback has actually been one of the NFL’s finest on third downs this year. He’s completing 76.9 percent of third-down tosses and 69.2 percent of them have gone for first downs, according to Kevin Fishbain of ChicagoFootball.com. Jay Cutler is completing 76.9% of his passes on 3rd down (20-of-26). 69.2% of 3rd-down passes have gone for 1st down, which is best in NFL. Cutler’s hamstring injury, which sidelined him for a game-and-a-half, has devalued an otherwise efficient start to the season. In the two full games in which Cutler has played, the Bears are 1-1 with a close loss to the undefeated Green Bay Packers in Week 1. They are 0-2 when backup Jimmy Clausen plays. 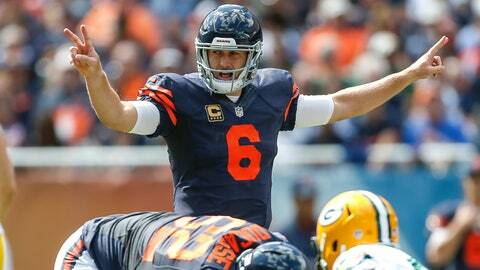 If the Bears want to rebound from their 1-3 start this season, the key will be to keep Cutler healthy.